A proper birthday party requires a proper birthday party invitation, and this packet of 15 invitations (w/envelopes) fill the bill in a most delightful way. 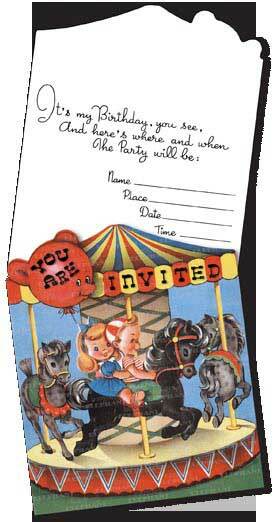 The die-cut carousel (4” X 5”), reproduced from a vintage birthday card, evokes fun and is appropriate for a range of ages. Does it remind you of an invitation from your own childhood? Includes space for the host to fill in all the pertinent information.